Rani Velu Nachiyar was the first queen to fight against the British colonial power in India. 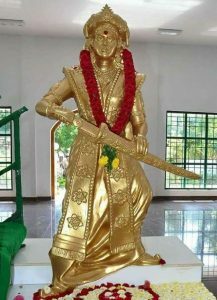 She is known by Tamils as Veeramangai.She was the princess of Ramanathapuram and the only child of Raja Chellamuthu vijayaragunatha Sethupathy and Rani Sakandhimuthal of the Ramnad kingdom. 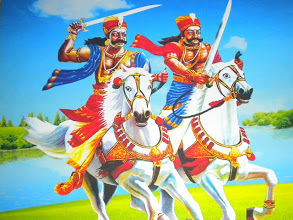 Rani Velu Nachiyar was trained in war match weapons usage, martial arts like Valari, Silambam (fighting using stick), horse riding and archery. She was a scholar in many languages and she had proficiency with languages like French, English and Urdu.She married the king of Sivagangai, with whom she had a daughter. 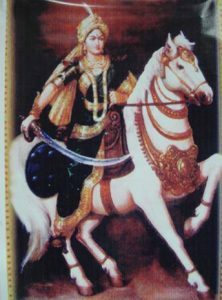 When her husband, Muthuvaduganathaperiya Udaiyathevar, was killed by British soldiers and the son of the Nawab of Arcot, she was drawn into battle. She escaped with her daughter and lived under the protection of Palayakaarar Kopaala Naayakkar at Virupachi near Dindigul for eight years. Frustrated by the joining of forces against him, the Nawab ordered that Velu Nachiar and Marudhu Brothers were permitted to return to Sivaganga and rule the country subject to payment of Kist to the Nawab. Abiding by this Order, Rani Velu Nachiar accompanied by Marudu brothers and Vellachi Nachiar entered Sivaganga. An agreement was reached where by Rani Velu Nachiar was permitted to govern the Sivaganga Country and Chinna Marudu, the younger was appointed her minister and the elder Vellai Marudu as the Commander-in-chief. Thus the widow Queen Velu Nachiar succeeded her husband in 1780.The Queen Velu Nachiar granted powers to Marudhu Brothers to administer the country in 1780. Rani Velu Nachiyar was the first queen to fight for the freedom from the British in India. She granted powers to the Marudu brothers to administer the country in 1780. Velu Nachiyar died a few years later,on 25 December 1796. Marudu brothers are the sons of Udayar Servai alias Mookiah Palaniappan Servai and Anandayer alias Ponnathal. They are native of Kongulu street of Ramnad. They belonged neither to the family of the ancient poligars nor to their division of the caste. Servaikaran was the caste title and Marudu the family name. 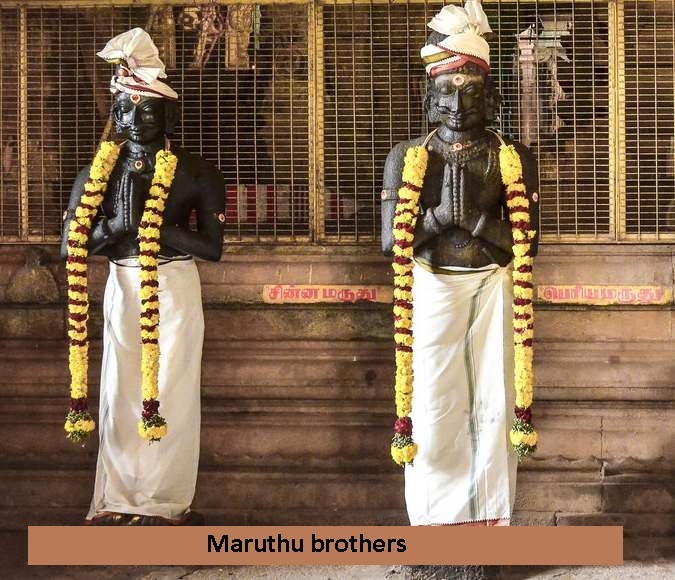 The Marudu Brothers served under Muthu Vaduganatha Thevar. Later they were elevated to the position of Commanders. Boomerangs are peculiar to India. Two forms of this weapons are used in India. These weapons are commonly made of wood. It is cresent-shaped on end being heavier than the other and the outer edge is sharpened. Their name in Tamil is VALARI stick. It is said that Marudu Brothers were experts in the art of throwing the valari stick. It is said that Marudus used Valari in the POLIGAR wars against the English. The Marudu brothers with 12,000 armed men surrounded Sivaganga and plundered the Nawab’s territories.The Nawab on the 10th of March 1789 appealed to the Madras Council for aid. On 29th April 1789, the British forces attacked Kollangudi. It was defeated by a large body of Marudu’s troops. Marudu brothers was in close association with Veera Pandiya Kattabomman of Panchalankurichi. Kattabomman held frequent consultations with Marudhus. After the execution of Kattabomman in 17th October 1799 at Kayattar, Chinna Marudhu gave asylum to Kattabomman’s brother Oomadurai (dumb brother). He issued an epoch-making Jumboo Deweepa proclamation to the people in the island of Jamboo the peninsular South India to fight against the English whether they were Hindus, Mussalamans or Christians. At last the Marudhu Pandiyars fell a victim to the cause of liberating the motherland from the English supremacy.